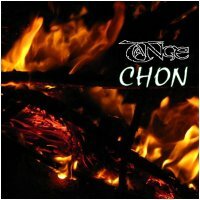 CHON = Carbon, Hydrogen, Oxygen, Nitrogen, the by-products of fire. So, what does this music signify? What's it all about? The answer's simple: nothing at all! That's it! No ulterior motives, just a piece of extremely deep and slowly evolving ambient music (or rather, two pieces) composed purely for their own sake, but with those ideas in mind. Drone ambient with nature-sounds and analog-style elements. Very enjoyable and relaxing to listen to.